The disease is known to involve the sacro-iliac joint (joint between hip bone and spine) and joints of the spine (intervertebral joints). The inflammatory changes lead to erosion of the junction of adjacent vertebra with the subsequent bone formation resulting in a rigid spinal column. As the disease progresses the vertebrae may fuse together (ankylosis). 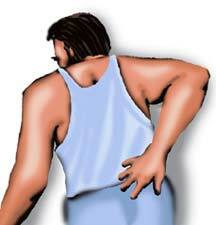 a dull, diffused low back pain and stiffness, especially in the morning. mild fever and loss of appetite. 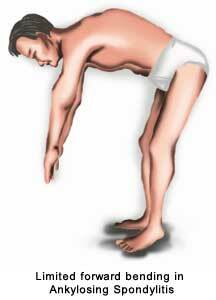 difficulty in bending backwards, turning sideways (rotation of spine) & limited bending of spine forward (spinal flexion). chest expansion is restricted due to involvement of joints of mid back (thoracic spine) and neck (cervical spine) resulting in pain, stiffness and limited movement of ribs, shoulder blades. pain and watering of eyes (iritis) may be present. breathlessness and swelling in the body due to involvement of the heart.